When was the last time you thought about the way you breathe? Did you know that it can influence the health of your pelvic floor and overall health? It might be difficult to understand the link between breathing and its effects on your health when you have been doing it from the second you were born. But many things can disrupt this automatic function including injuries, pain, pregnancy, chronic stress and poor posture; all of which may lead to poor breathing patterns. Proper breathing comes from the diaphragm. It is a domed shape muscle under the rib cage. Parallel to it are the pelvic floor muscles. 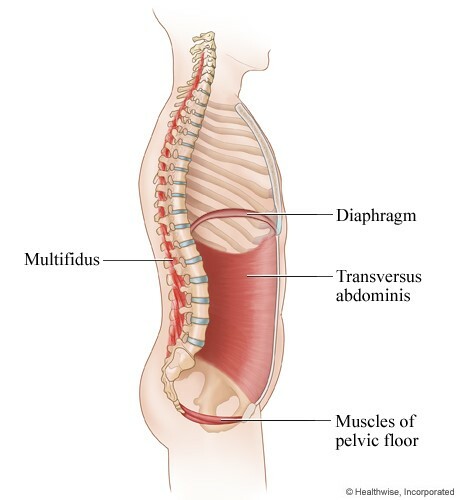 To put it simply, the diaphragm is the top part of the core muscles working with the transverse abdominus in the front of the body, the multifidus in the back of the body and the pelvic floor at the bottom. During normal inhalation, the diaphragm and the pelvic floor descend. Upon exhalation, the diaphragm pulls the pelvic floor up providing a lift support for the organs. When this function is disrupted, compensations can arise which may lead to pain and dysfunction. Learning the diaphragmatic breathing technique and practicing breathing exercises can help promote the coordinated activity of your deep core muscles and pelvic floor. Other benefits of diaphragmatic breathing include stress reduction and a decrease in blood pressure. 1. Lying on your back with your knees bent, place one hand above your belly button, just below your rib cage. You may put the other hand on the side of your rib cage. 2. Breath in slowly and notice the stomach rise slightly, the chest remains calm as the ribs expand laterally. 6. Once you have mastered it lying down, you can progress into sitting and standing. But don’t forget the need for proper posture.